The turmeric plants were cultivated by Harappan civilization earlier in the 3000 B.C. It is basically a tropical plant of ginger family is the rhizome or underground stem, with a rough, segmented skin. It looks much like ginger and turns things into a lovely orange-yellow shade. Turmeric is of Zingiberaceae family, Zingiberaceae - A family of tropical monocotyledonous plants of order Musales. Turmeric is also known as Curcuma longa or curcumin. 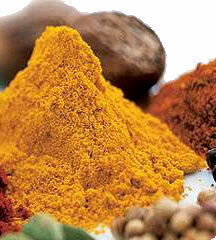 The maximum production of Turmeric (90%) is in India. Sangli is the largest and most important trading centre for turmeric in Asia also in the world. Sangli is the town of Indian State Maharashtra. There are approximately 30 varieties have been recognized in the type of Curcuma in which turmeric belongs. 'Alleppey Finger', 'Erode and Salem turmeric’, 'Rajapore' and 'Sangli turmeric', 'Nizamabad Bulb' are some popular varieties of India. Curcumin is the active ingredient in turmeric and have wide range of therapeutic effects. It has been used for thousands of years as a safe anti-inflammatory in many ailments as part of Indian traditional medicine - Ayurvedic medicine is a more than 3,000 year old comprehensive medicine system. Curcumin is also an antioxidant that helps to stabilize membranes damaged by inflammation. According to recent research results the component curcumin causes degradation of the human protein p35 which is responsible for removing damaged cells that are likely to become tumors. This effect would - in contrary to the research activities to use it as a treatment for cancer –increase the risk of developing tumors. Turmeric has wide range of use in canned beverages, ice-cream, yoghurts, yellow cakes, biscuits, sweets, cake icings, baked products, dairy products, popcorn-colour, cereals, sauces, gelatins, cosmetics, medicinal, ayurvedic medicines etc. It is commonly used in curries, best-known in Indian and Thai cuisine, also used in many other countries. It is an essential ingredient in curry powder and also used in mustard blends and relishes. It is used in holy ritual and also used to make kunkuma, a red cosmetic powder. In India, at the time of wedding, turmeric paste is applied over the bride and grooms body mainly face and arms. The turmeric-based paste is used to beautifying and enrich skin complexion. The curcumin powder dissolved in alcohol is used for water containing products. It is popular served as a tea in Okinawa, Japan. Turmeric is popularly used in cosmetic industry for preparing herbal products. It is also used as a fabric dye, a usually soluble substance for staining or coloring in fabrics as well as for preparing natural hair dye. Turmeric is very low in Cholesterol and Sodium. It is also a good source of Vitamin C and Magnesium, and a very good source of Dietary Fiber, Vitamin B6, Iron, Potassium and Manganese.